So I have the basic setup ready with one relay that is controlling a 200W bulb. The Phase of this bulb is passed through a current sensor acs712. 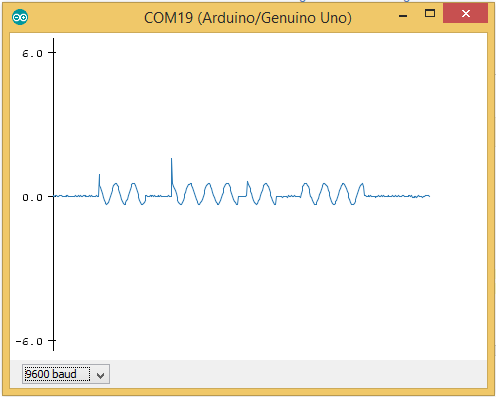 While running a simple analog read example sketch, I get output 511 from ADC, which is as expected. Then I subtracted this 511 from my measurement and observed the results while turning on/off the bulb. While the bulb is off, the current remains 0, but when I turn on the bulb, the voltage fluctuates over positive and negative side. Why is the sensor showing this behavior ?, I am not using any additional capacitor for noise reduction. Do I need to ? but I guess this is not noise. Is it ? You are seeing that because that is what the current is doing. It's called AC - Alternating Current. It's what the mains current is. To work with AC you have to rapidly sample over a short period to get the maximum and minimum values. Subtract one from the other and that gives you the peak-to-peak current. You can then use that to calculate the RMS current which is what you are (most likely) interested in. Not the answer you're looking for? Browse other questions tagged arduino-uno sensors relay current or ask your own question.